The black-footed ferret, nicknamed the “masked bandit” for its racoon-like markings, is one of the most endangered mammals in North America – so scarce it was once thought to be extinct. The last of the wild population of black-footed ferrets was thought to have died in 1974 in South Dakota, and the last ferret of the captive breeding program died in 1979. 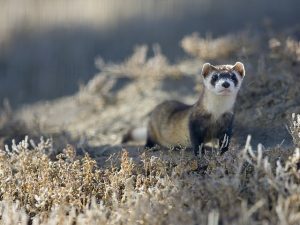 Somehow, though, a number of ferrets were secretly surviving near the small town of Meeteetse, Wyoming. In 1981, a cattle dog named Shep brought a dead ferret home to his owners. The ranchers took the ferret to a local taxidermist, who identified it as the once “extinct” black-footed ferret.